The University of Southern Maine recently teamed up with the Summit Project, an organization that honors Maine’s fallen service members, to help preserve the memories of those who gave their lives in the line of duty. A group of more than 30 people, including volunteers from the Summit Project, USM students, faculty and staff, participated in a 6.5-mile march around the City of Portland on Friday, March 6 as a part of a living memorial to the state’s fallen service members. The volunteers carried 25 stones engraved with the names of Maine veterans killed in Iraq and Afghanistan from the military entrance processing station (MEPS) on Congress St. to the Abromson Center on USM’s Portland campus, by way of the Eastern Promenade and Baxter Boulevard, where they will remain on display for two months. Known for their stone-carrying tribute hikes in Maine and beyond, Summit Project volunteers have a personal connection to the mission. They carry the stones during the hikes, each engraved with the name of a fallen Maine hero. The stones are not just a static memorial, but are meant to fully recognize and preserve the memories of the fallen service members through educating those who participate in the tribute hikes or marches. “To me, (the weight of the stones) represents more than anything the weight that the family members have to endure every day of their lives,” said Greg Johnson, the event’s organizer and USM criminology student, to WCSH-TV. USM students and faculty will stand guard over the memorial display case while it is on campus. 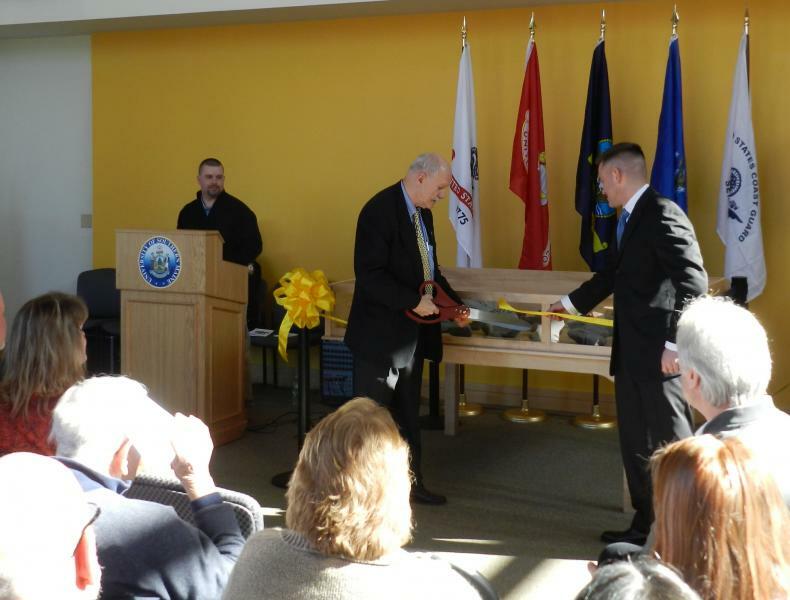 “USM will take the job of guarding the memories of our fallen soldiers very seriously,” said USM president David Flanagan at the ribbon-cutting ceremony for the honor display case. Rodney Mondor, student success coordinator on USM’s Portland campus, carried the stone of Army SPC Christopher Gelineau, a USM student that Mondor previously worked with. The stone Mondor carried to represent Gelineau’s memory was found on USM’s Gorham campus. “We’re not just carrying stones, we’re carrying memories,” said USM Student Body Vice President Rebecca Tanous to the Free Press. Tanous carried the “duty” stone, one of the twelve “spirit” stones that embody a specific theme tied to military service. “When looking into what duty means, I discovered that it’s about more than just accepting responsibility, but it’s also about seeking opportunities to improve oneself,” said Tanous. The Summit Project was the creation of Maine native and active-duty U.S. Marine Corp Major David Cote, who’s made it his mission to honor the state’s war casualties and the faithful spirit of all Mainers. To learn more about their cause, check out the Summit Projects’s website. For Johnson, a Marine Corps veteran, the mission of the Summit Project is a simple one: to ensure the families of the fallen that Maine heroes will not be forgotten. “If for one moment we can take these stones and can carry them to take some of that weight off of their shoulders, then we’ve done our jobs,” said Johnson.